Thousands attended the ‘Scotland United’ rally to celebrate multicultural Glasgow on Saturday 14th November in Glasgow Green, and forced the fascists off the streets of the city. On the decision of the City Council, police read the Riot Act to an attempted gathering of Scottish Defence League, who tried to mount an anti Islamist presence in the city. 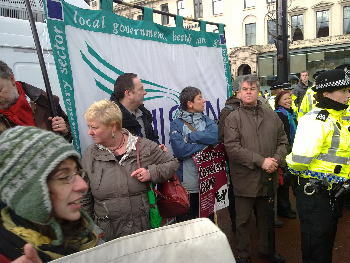 UNISON banners were to the fore of trade unions on the march. Speeches before the march from Deputy First Minister Nicola Sturgeon, Grahame Smith, Gen Sec STUC, Anabele Goldie (Tories), Mohammed Sarwar MP (Labour) , Robert Brown MSP (Lib Dem), Clr Ruth Black, Amer Anwar (Scotland United) defied any attack on the community. The rally heard that today the racist and fascist thugs threaten Muslims, tomorrow it could be Jewish people, Hindus, Sikhs, black people, lesbians & gay men, trade unionists, travellers or Eastern Europeans, asylum seekers. 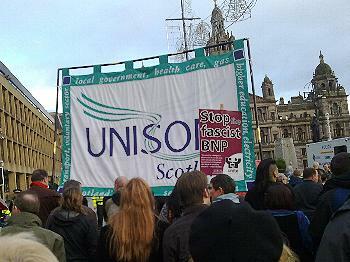 There is no place for Nazis, racists or the BNP in Glasgow’s multi-racial, multi-cultural and multi-religious community. The rally left the Green to march to George Square outside City Chambers next to the War Memorial, where a two minute silence was held for all victims of racial violence. This was our response to anti-Muslim protest at Central Mosque planned by racist bigots, of the Scottish Defence League and English Defence League (EDL). Previous EDL demonstrations have seen their thugs attack Asian people, chant “Muslims out” and worse at passers-by and make “Sieg Heil” Nazi salutes. It is vital that we do not allow these racist thugs to terrorise and intimidate Muslim and Asian people. The rally and march were a clear declaration, that this is not a time to hide but to stand up for a multicultural Glasgow, a multicultural Scotland. The police had already stated that the SDL would not be allowed to march or even congregate outside any Mosque. A BNP candidate in the Glasgow NE by election on Thursday did attract 1000 votes, but Scotland United brought together all those who wish to live in a multicultural, multiracial, democratic society.